It's a proven cleaning workhorse that has driven dirt and grime from household surfaces for generations. Ajax has a cleaning formula that has continued to be one of the top performers for getting rid of grime in a wide variety of places. The Colgate-Palmolive Company created Ajax in 1947. It was the first of the burgeoning company's major brands that was a huge hit with the public. It became a number one household cleaner in the 1960s and 1970s. It was nicknamed the "white tornado" for its aggressive cleaning action. In the 1980s, the company produced a successful liquid formula of Ajax. These came with or without bleach as colored and stained countertops became more popular. What Is Ajax Made Of? Calcium carbonate: Ajax is made from limestone that is heated and mixed with water before carbon dioxide is added to produce calcium carbonate, which is then dehydrated. Sodium dodecyl benzenesulfonate: This is a serious cleaning agent. When used in high concentrations and not mixed with Ajax's other cleaning ingredients, it can cause irritation. Ajax can be used on any surface that doesn't scratch easily and can stand up to tough cleansers. Ajax in a sink, either porcelain or stainless steel, can remove hard water stains, discoloration from toothpaste and dye from foods, such as tomato-based sauces or turmeric. Sprinkle Ajax in a toilet to remove hard water rings and discoloration in older toilets. Ajax has been paired with bleach by generations of house cleaners who want to create gleaming surfaces. Mixing extra bleach with Ajax isn't a good idea because it can create a toxic cloud that can be overwhelming. People may be surprised that this cleaning powerhouse already contains bleach. It's part of what makes it such a good cleaner. If you want to eliminate traces of bacteria from food on the counter and brighten dull countertops, then grab the Ajax with bleach. It is a proven product for whitening clothing, tired kitchen and bathroom tiles, plastic flooring and other materials that can handle a good scrubbing. The aroma of Ajax can be overpowering in certain situations. If you are using Ajax cleaner in a small space, it is best to use it sparingly and with plenty of ventilation. Always make sure the surface or material on which you are sprinkling Ajax won't be damaged by the powerful potion. Ajax is known for its power. Its original slogan was "Stronger than Dirt!" It can irritate skin, particularly when working with tough scrubbers and in and around rough areas. Put a few safety measures in place to protect your skin, eyes, mouth and nose. Wear protective rubber gloves with a good grip on the palm and fingertips. This will keep the scrubber or sponge you are using from slipping out from under the rubber glove as you bear down on difficult stains. Protective eyewear should wrap around the sides of your face. This will keep the cleaner from accidentally splashing into your eyes. A simple face mask can stop the aroma of Ajax from irritating your mouth, nose and lungs if you are working in a small space or over a long period of time. If you are simply performing regular cleaning maintenance, sprinkle a light layer of Ajax over the area. 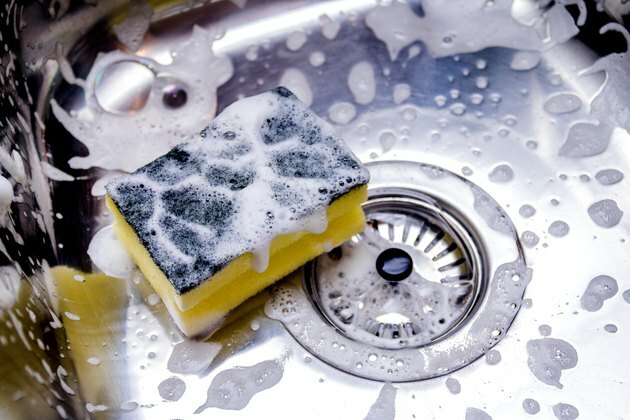 Work a sponge over the surface, applying more pressure where stains or clumps of grease mar the surface. Ajax can leave a film if it is not properly removed. With a clean, damp sponge and a towel, go over the area once again. This will also remove any small leftover stains. Buff the surface dry with a clean towel once the surface is completely rinsed of the powdered cleaner.